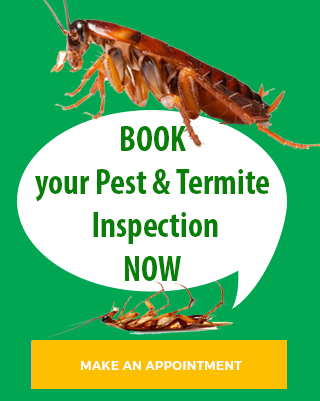 Evergreen Pest Management can determine the type, source and extent of the flea and pest infestation, then use registered insecticides to control the fleas. Effective flea control often relies on the application of chemical insecticides, growth regulators and dusting. The solution for successful flea control is: treatment of the pet and the pet’s environment (if necessary in and outside the house) along with some patience. We service all areas from the Gold Coast to Northern NSW including Burleigh Heads, Palm Beach, Elanora, Currumbin, Tullebudgera, Tugun, Bilinga, Kirra, Coolangatta, Tweed Heads, Banora Point, Terranora, Bilambil, Chinderah, Fingal Heads, Kingscliff, Cudgen, Salt, Pepper, Reef, Casuarina Beach, Duranbah, Tumbulgum, Condong, Eviron, Murwillumbah, Mooball, Burringbar, Uki, Bray Park, Clothiers Creek, Cabarita Beach / Bogangar, Hasting Point, Pottsville Beach, North & South Golden Beach, New Brighton, Ocean Shores, Brunswick Heads, Billinudgel, Mullumbimby, Byron Bay, Suffolk Park, Bangalow. 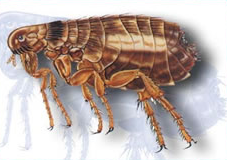 Fleas are small dark, reddish-brown, wingless, blood-sucking insects. Their bodies are laterally compressed, (i.e., flattened side to side) permitting easy movement through the hairs on the host’s body. Their legs are long and well adapted for jumping. The flea body is hard, polished, and covered with many hairs and short spines directed backward. The mouthparts of an adult flea are adapted for sucking blood from a host. 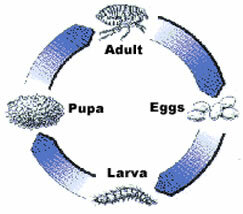 The life cycle of the flea is similar to that of a moth – egg, larva (caterpillar), pupa (cocoon) and adult. A newly hatched adult flea is unfed, small, black and aggressive – some people mistakenly refer to these as ground or sand fleas. After they have had a blood meal, fleas lighten in colour and become larger. For every flea on your pet there may be hundreds waiting to hatch! Fleas lay eggs on the pet when the host is resting. The white eggs fall off the pet onto the carpet, soil etc. Small blind larvae emerge from the eggs. These larvae move away from the light, burrowing down into the carpet, cracks in floorboards or into the soil. They feed on protein, such as flea droppings of partly digested blood. They moult three times before forming a pupa. The larva changes into the adult in the pupa. The pupa is sticky, so it binds its surrounds to itself, becoming invisible. In summer, a flea may be ready to hatch from the pupa about 7-14 days after it is formed, however they can remain dormant for up to 18 months. Hatching of the flea from the pupa is triggered by nearby movement, predominantly during warm, moist weather conditions. After feeding on the host, the engorged female flea is ready to mate and lay eggs – about 24 hours after hatching. She is capable of laying up to 500 eggs (27 per day) over a lifetime which may span several weeks. Sometimes flea treatments appear to be ineffective as small black fleas are seen after the treatment. This is because the pupae are quite resistant to chemicals. Fleas continue to hatch because insecticides cannot penetrate the flea pupa case. Ten fleas can potentially reproduce to 250,000 in only 30 days! 1. Treat your pets as soon as you can. You will get better results if all flea treatments – environmental and on animal – are done around the same time. 2. DO NOT AVOID FLEA INFESTED AREAS AFTER THE TREATMENT – YOU WILL REDUCE THE EFFECTIVENESS OF THE TREATMENT – especially remember the spare room, shed or places where the pet likes to rest. 3. If you remove the pet, flea problems may appear to be worse – as you become the only potential host. 4. 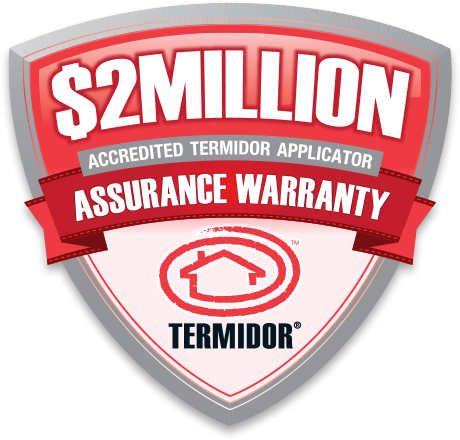 It is best to treat before the numbers build up. There is no need to go through the discomfort of flea bites. 5. Entering vacant houses will stimulate any fleas waiting to hatch. This is especially a problem with vacant rental and holiday houses. 6. If you are going on holidays, have a friend stomp through the house/yard several times while you are away, especially on the day of your return – the fleas will hatch and die on the treated surfaces before you return. 7. Do not vacuum for at least seven days after treatment. 8. Be patient. Even if everything has been done correctly, you will still see newly hatched fleas, usually for several weeks. Do not leave flea infested areas undisturbed – movement hatches fleas.